Mayan families lived as nuclear units where members of the same family huddled together and lived as a single group. The house of such a family was a thatched hut with no interior partitions. Upon marriage, a Mayan man was required to live with his wife’s parents for a set period and work for them. After this, he built a home to next to his parents’ home and lived there. Daily tasks of the Mayan men in the families included farming on the fields and hunting for meat. Women remained at home and took care of the household chores. Children helped their parents in different tasks such as fetching water. 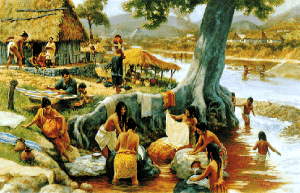 A typical Mayan household didn’t comprise of a single family in the modern sense of the word. Rather, extended families lived right next to each other, usually in shared quarters. They built homes in the same neighbourhood and huddled together over shared spaces such as shared kitchens. Most Mayan nuclear families also shared other space such as storage areas. The houses themselves comprised of thatched huts which usually had no more than a single room. Each house hosted a large family. Mayan families lived as nuclear units where members of the same family huddled together and lived as a single group. The commoner families lived in hut-shaped homes which often had mud packed in the walls to guard against extreme temperatures. All the family members slept at the same place, on beds made out of mats. Cotton blankets were used to keep warm during the night. The houses of the nobility were more spacious and were built with more stable materials, such as stones. Men in Mayan families spent laborious days working on fields or engaged in other agricultural activities. They also went out to hunt animals for meat. In some families, men would render up their services to the nobility and the royalty in the form of direct labour. They did this by working on monumental architecture or working on any other structures built by the Mayan elite. In return, the families of these men were invited to the notable events and celebratory occasions of the nobility which were often accompanied by religious rituals. Mayan women were mostly confined to performing different household chores. They spent most of the time at home with their children and instructed them in morals while also teaching them to perform different simple tasks. Most Mayan houses had a small garden right next to their homes. Women usually tended to these gardens while the men were away and took care of the vegetables that were commonly grown in them. Mayan women also took care of the upbringing of their daughters in particular, teaching them different household tasks as they neared the age of marriage. Some Mayan women also took up the more public roles of matchmakers and midwives but such instances were rare. Some women in the Mayan royalty assumed even more active roles, in some cases even residing over religious rituals. Marriage in Mayan society usually marked the occasion of a man’s departure from his family house. A Mayan man built his own house next to his ancestral house when he reached the age of marriage. In some cases, the groom was required to live with the bride’s parents for a specific number of years, as a sort of payment for marrying their daughter. After this duration, he was free to go back to his own house and lived in the same neighbourhood as his parents. Divorces in Mayan society were fairly rare. They simply comprised of the two partners leaving each other. This usually happened when it was realised that one of the members was infertile and that the couple would have no children. Divorce also took place in cases where one of the two partners refused to shoulder his or her responsibilities. If one of the partners died, the widow of the deceased was required to stay unmarried and single for a period of at least one year. After this period, the widow was allowed to remarry. Mayan children, especially in the commoner families, were raised and educated by the parents. The parents first taught them about social customs and morals as they grew up. This was important because Mayan laws were based on religious morals and violation of these laws could lead to severe punishments. Male children were taken by their fathers on outdoor errands and tasks after the age of 6 or 7. In some cases, boys were sent away at a very young age to apprentice with skilled masters and learn specific skills such as stonemasonry or artwork. In other cases, they simply worked in the same line as their fathers. Religious rites at the occasion of birth and puberty were celebrated. Girls usually stayed at home after puberty. In Mayan society, inheritance took place between the male members of the family. Female members of the family didn’t inherit anything legally. The things inherited by the male members included not only the property of the deceased person but also his titles. In some cases, for instance, if a person died with a military job, he son inherited the job upon his death. Similarly, titles and government offices were also inherited from one generation to the next. If the inheritor was too young at the time of his father’s death, he was placed under a trustee who used the inherited estate to support the young descendant. Mayan families lived together as nuclear units centred on the same area. The son of a Mayan man, for instance, built his home right next to his father’s home after he got married. Men in Mayan families took up outdoor jobs such as farming and hunting whereas women concerned themselves with household chores. Children also lent hand in daily chores from a fairly early age. The homes of the commoners comprised of a single-roomed thatched hut which is where the entire family slept and lived. Kitchens were usually shared between multiple households of the same family.